What’s not to love, admire and appreciate about Coco Chanel…. A true fashion inspiration for me. 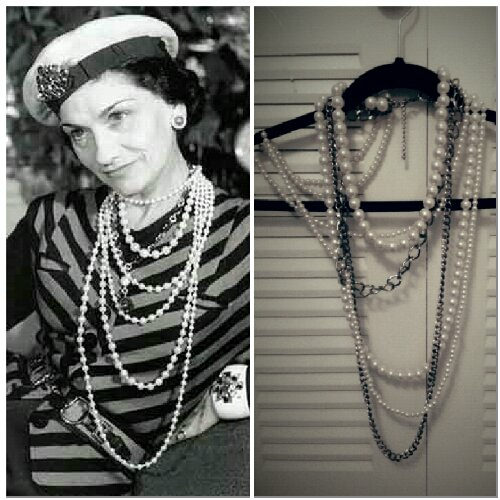 When I look for classic, elegant and vintage pieces for my online boutique, I always ponder on what life was like in those times, how a woman would dress, put her point of view across and be heard in a man’s world…Coco Chanel certainly made an impact that lives with us till this day. On one of my vintage shopping adventures I spied this ‘Chanel-esque’ multi-strand necklace and knew I had to have it for my boutique…the classic pearls with a touch of modern in the silver chains, quickly drew my attention…. froim other writers and use something from their websites.